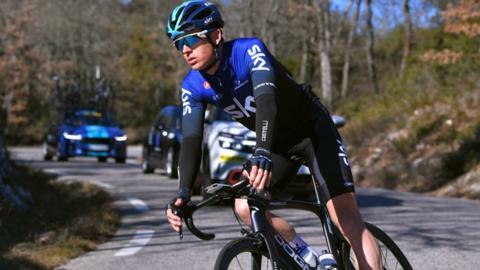 Team Sky's Ben Swift is in intensive care with a ruptured spleen after crashing on a training ride with Geraint Thomas. The 31-year-old clipped a rock while descending, causing him to crash heavily, Team Sky said. Swift, who finished fifth in the UCI Road World Championships in 2017, was training in Tenerife when the incident happened on Wednesday. "I am still in intensive care at the moment," Swift tweeted. "But I hopefully move on to a normal ward tomorrow. They have stopped the bleed in the spleen. But just need to keep monitoring it. Along with that I have facial wounds and road rash." Team Sky doctor Inigo Sarriegui added: "Swifty suffered quite a heavy crash while out training. Thankfully though, he didn't lose consciousness and was aware of the incident afterwards.